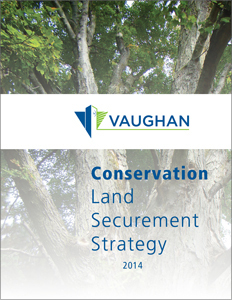 We recently completed a Conservation Land Securement Strategy for the City of Vaughan. The Strategy is a comprehensive land securement planning document, which outlines methods for the creation of an informed and effective land securement initiative for the purposes of long-term natural heritage land protection in Vaughan. The Strategy will be used by Vaughan as a framework for the long-term protection, maintenance and, where possible, improvement of the NHN. The Strategy illustrates initial recommendations to implement a conservation land securement program and suggests criteria to consider when focusing conservation land securement efforts, including ways to engage landowners (landowner contact program), securement mthods, suggestions for preferred securement tools by audience, and finally, considerations for working with individual landowners. The report summarizes all components required for a successful program to be implemented on the ground with willing landowners. Vaughan residents have inherited a rich natural legacy that includes diverse ecosystems, flora and fauna, and areas of spectacular beauty. Parts of Vaughan are located within the Oak Ridges Moraine and Ontario’s Greenbelt, the landscape is also characterized by the upper portions of the Humber and Don River watersheds and the sub-watershed of Black Creek, a tributary of the Humber River that is also the site of Black Creek Pioneer Village, an open-air historic museum. Among the City’s key natural areas are the 237-acre Boyd Conservation Area located along the Humber River Valley and the 800-acre Kortright Centre for Conservation, both owned and operated by Toronto and Region Conservation Authority (TRCA). The City also features a number of significant valley systems, the largest formed by the Humber and East Humber Rivers in the western portions of the City, and the Don River in the east.